Nowadays, Every one wants to get wedded in the royal manner. And why not, after all this is the most important and life changing experience in one’s life. All of us want to make our D-Day special and we’ve got the perfect spot for the most stunning royal weddings which will make you feel no lesser than nawabs! We know how much you would love a grand wedding and that is why We’ve got here the most heritage venues from Hyderabad which has royal heritage destinations for the most grand destination wedding! 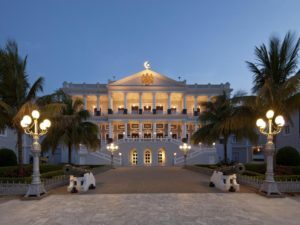 Taj Falaknuma palace: Taj Falaknuma palace is the vast stretch of picturesque land which is ideal for the majestic royal wedding. The high ceilings, green lawns, widely spread areas, huge rooms welcomes and serve you pleasantly for you D day. The lit chandelier makes your special moments more magical where you can create and store majestic memories forever. The sprawling lawns and beautiful view and surrounding, the impeccable services welcomes your guests and will make your wedding more memorable. 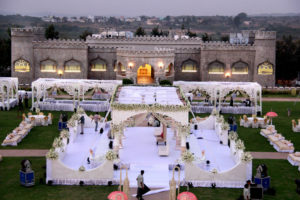 Fort Grand Shamshabad: Create a lifetime of memories by hosting it in the fort grand. Located at countryside amidst the green lawns, it’s the heritage fort that has all the modern amenities. The charm of the heritage makes you feel no lesser from the nawabs. It’s the dream place to host a wedding. The Nawabi touch will make the wedding memories more mesmerising. The vast stretch of lands and stunning view awaits to welcome each one of your guests and make every wedding ritual mesmerising. 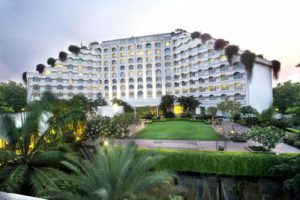 Taj Krishna Banjara Hills: When you host a wedding at taj Krishna, you get multiple options as there are variety of indoor and outdoor options to host your wedding and other ceremonies. The Venue offers flawless decor and services. The high-ceiling ballrooms, halls overlooking lawns, open lawns are a few of many venues offered by the taj Krishna to make your wedding memorable.